Myotonic dystrophy type 1 (DM1, also known as Steinert's disease) is the most prevalent hereditary neuromuscular disease (NMD) in Western countries., The condition's muscle-related symptoms include distal and axial muscle weakness and myotonia (residual resistance after muscle contraction that is attributed to a decrease in membrane chloride permeability). The genetic defect underlying DM1 is an unstable, expanded CTG triplet repeat in the untranslated region of the dystrophia myotonica protein kinase (DMPK) gene on chromosome 19. Recent molecular genetic studies have described the impact of the CUG repeats in the DMPK transcripts on the biogenesis of several mRNAs, which cause the polymorphic symptoms in DM1. It has been shown that RNA inclusions in the nuclei of patients with DM1 interfere with splicing of the chloride channel 1 gene (CLCN1) mRNA. This leads to the abnormal inclusion of CLCN1's alternative exons 6B and/or 7A and retention of intron 2. The end result is abnormally high membrane resistance for CLC-1, which has been correlated with the electrical hyperexcitability of muscle fibers and therefore myotonia. Although the myotonia is typically noted in the hand muscles of DM1 sufferers, it is not usually described in leg muscles. Nevertheless, Logigian et al. showed that waxing–waning myotonia occurred in distal leg muscles of patients with DM1. In 1996, Wright et al. provided the first report on gait in DM1 (in five participants). The researchers showed that gait abnormalities in DM1 were related to distal weakness and the excessive use of hip muscles. Galli et al. analyzed the gait parameters of ten DM1 patients. In addition to the expected distal muscle weakness, the researchers also observed abnormal muscle activation in the distal leg muscles during gait. Bachasson et al. observed that the center of pressure (CoP) velocity was greater in DM1 patients than in healthy controls and correlated with neck flexion and ankle plantar flexion weakness. Radovanović et al. showed that temporal and stride characteristics were altered in DM1 and DM2 compared to healthy controls. Since previous studies have probably not elucidated all the gait abnormalities in DM1, we decided to assess gait in a group of DM1 patients. Our study included a functional assessment and a three-dimensional (3D) motion analysis (including kinematic, kinetic, and mechanical parameters, electromyography [EMG], and energy cost). Hence, the objectives of the present study were to (i) characterize gait abnormalities in a population of patients with DM1 and (ii) analyze the relationship between gait variables and functional impairment. The results should allow an improvement of the rehabilitation interventions. Preliminary results of this study were presented at the Biomechanical Society Congress in Toulouse (France) in October 2012 and published in a short report. The study participants were all affected by DM1 and had a confirmed molecular diagnosis (>50 CTG repeats) aged from 14 to 53 years. They were recruited from the NMD outpatient center at Saint-Luc University Hospital (Brussels, Belgium). The participants had to be able to walk at least 100 m without assistance and were not included in the study if they presented any of the following criteria: inability to walk on the treadmill, damage to the central nervous system or musculoskeletal system that could affect the person's ability to walk, and finally, pregnancy. A total of 15 patients participated to this study (10 males and 5 females; mean ± standard deviation [SD] age: 38.1 ± 11.4 years; mean time since disease onset: 16.3 ± 7.9 years). All the participants had been provided with written information on the study's objective and protocol and had given their written, informed consent before involvement in any study-specific procedures. This study was approved by the Independent Ethics Committee at Saint-Luc University Hospital. A timed 10-m walking test: The participants were asked to walk 10 m at a comfortable speed. The average completion time for three trials was recorded. Anthropometric parameters were measured and recorded. The participants were instructed to walk barefoot on a motorized treadmill mounted on four 3D strain-gauge force transducers. For each patient, the highest comfortable walking speed on the treadmill was recorded. Gait was assessed by 3D analysis. Segmental kinematics were measured with the Elite System (BTS, Italy) at 200 Hz. Eight CCD-infrared cameras measured the 3D coordinates of 19 reflective markers positioned on specific anatomical landmarks. Euler angles and Newtonian mechanics were used to compute the angular displacements of the pelvis, hip, knee, and ankle. For each participant, 10 successive walking cycles were recorded and averaged. Data were normalized against time expressed as a percentage of the gait cycle, with 0% corresponding to the initial foot contact on the analyzed side. Spatiotemporal parameters were assessed as 3D kinematics according to the method described by Mickelborough et al. Kinetic data (Mz: muscle moment and Mk: power) were computed by synchronization of the kinematics and 3D ground reaction forces (GRFs). The algorithm described by Davis and Cavanagh enables determination of the CoP and vertical GRF under each foot. Using an inverse dynamic approach, exploitation of the GRF, kinematic, and anthropometric data enabled us to compute the net joint moments of the hip, knee, and ankle in the sagittal plane. The power at each joint was calculated as the product of the angular speed and the net joint moment. The muscle electrical activity of the vastus lateralis (VL), semitendinosus (ST), tibilalis anterior(TA), and gastrocnemius lateralis (GL) muscles was recorded by a wireless EMG system (BTS, Italy) through surface electrodes (Medi-Trace, Graphic Controls Corporation, NY, USA). The onset and cessation of muscle activity were both visually and mathematically determined by computing the EMG threshold voltage, as described by van Boxtel et al. The mean onset and cessation time for each activation sequence was calculated over 10 gait cycles, and the duration of the muscle activity was computed accordingly. The metabolic cost of walking was determined from the patient's breath-by-breath oxygen consumption (Vo2) and carbon dioxide production measured throughout the treadmill test with an ergospirometer (Quark b2, Cosmed, Italy). Energy consumption was measured throughout the treadmill test. Data acquisition started with the rest period. Thereafter, the participants walked at a self-chosen, comfortable speed. Kinematic, kinetic, mechanical, and EMG data were analyzed together during the same 40-s acquisition. Energy consumption measurement required a steady state of at least 2 min. Two acquisitions were recorded. The maximum extension moment (MzA) and power (PwA) of the ankle before toe-off. The duration of the EMG activity of the GL was recorded, as described above. The values are presented in diagrams that also show reference values from a population of eight healthy volunteers (mean age: 29 ± 16 years; weight: 65 ± 10 kg; height: 1.74 ± 0.05 m; no history of orthopedic or neurologic pathologies affecting the legs) evaluated at walking speeds from 1 to 6 km/h. The previous study of Lobet et al. described the gait on the treadmill of a normal population of eight participants: as walking speed was shown to influence gait variables, the values of the studied parameters were presented for the normal population with the normal mean values (±1 SD) as a regression line. The values of the patients were plotted as a function of gait speed, with the normal as described above. For the EMG, the activation time of the GL was plotted with the normative data that were published by Stoquart et al. for a population of 12 healthy volunteers. A covariance analysis including participants as a variant was performed. Statistical analyses were performed using SigmaStat software (version 2.0; Systat Software Inc., Chicago, IL, USA) and SPSS software (version 15.0; SPSS Inc., Chicago, IL, USA), with the significance level set to P = 0.05. Descriptive data on the study population are summarized in [Table 1]. The onset of DM1 had occurred in childhood in three cases and in adulthood in others. According to their medical history, none of our participants had lower extremity surgery. The mean spontaneous comfortable gait speed in the 10-m walking test was 3.9 ± 0.9 km/h. Depending on the patient, the gait speed during the treadmill test ranged from 1.3 to 4 km/h. 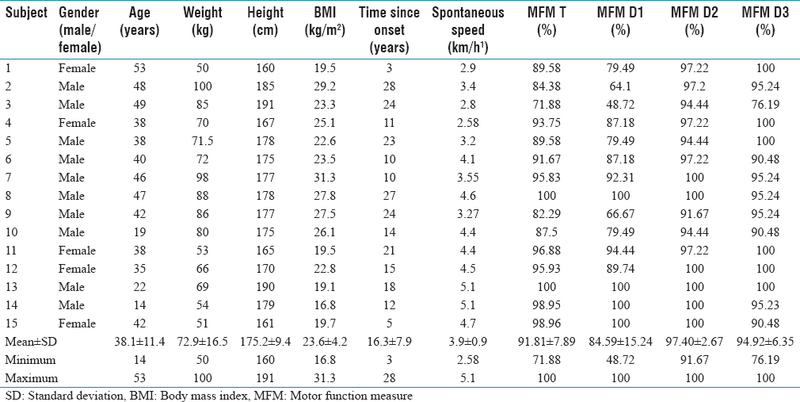 The mean motor function measure (MFM) was 91.9% ± 5.8%. Cadence was higher in all DM1 patients than in healthy controls (101.3 ± 13.9 and 81.15 ± 21.5, respectively, P < 0.0001), whereas step length was lower in all patients other than patient 5 (0.48 ± 0.14 and 0.58 ± 0.14, respectively, P = 0.023). The hip ROM was lower in patients relative to healthy controls (35.1 ± 7.8 and 39.8 ± 7, respectively, P = 0.0024). Five patients showed hyperextension of the knee during the stance phase. The AROMr during the swing phase was dramatically lower in the patient population than in healthy controls (24 ± 23 and 63.8 ± 15.1, respectively, P < 0.0001) [Figure 1]a, [Figure 1]b, [Figure 1]c.
The positive extension moment of the hip during the initial stance phase (MzH1) was higher in patients than in healthy controls (0.38 ± 0.21 and 0.29 ± 0.17, respectively, P < 0.0001), whereas the negative flexion moment (MzH2) during swing phase was lower in patients than in healthy controls (−0.48 ± 0.7 and −0.4 ± 0.22, respectively, P = 0.03). The hip extension power (PwH1) was lower in patients than in controls (0.24 ± 0.1 and 0.27 ± 0.24, respectively, P < 0.0001), and the hip flexion power (PwH2) was lower in patients than in controls (0.3 ± 0.14 and 0.32 ± 0.27, respectively, P = 0.0021). The negative extension power of the knee (Pknee) was higher in patients than in healthy controls (−0.82 ± 0.17 and −1.22 ± 0.71, respectively, P = 0.0043). The plantar flexion moment of the ankle during the propulsion phase (MzA) was lower in patients than in healthy controls (0.7 ± 0.35 and 0.81 ± 0.24, respectively, P = 0.0022). The external work (Wext) in DM1 patients did not differ from healthy controls, whereas the internal work (Wint) was higher in patients (0.32 ± 0.06 and 0.19 ± 0.06, respectively, P < 0.0001). Moreover, the metabolic cost of DM1 patients did not differ from healthy controls. Results of gait parameters, kinematic and kinetic data, and mechanical work in patients and controls are reported in [Table 2]. Activation of the GL was abnormally long in DM1 patients and persisted during the swing phase. [Figure 2] shows the GL activation for each participant, compared with a normal activation phase and as a function of speed. The normative data were published by Stoquart et al. for a population of 12 healthy volunteers. 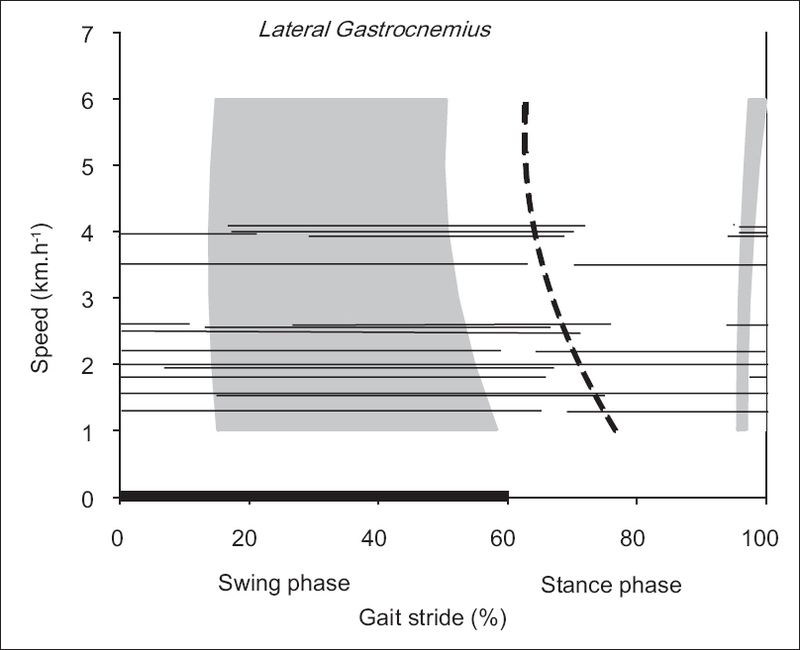 Figure 2: The activation phase of the gastrocnemius lateralis in patients (dark thin lines), compared with normal activation (gray area). The dashed line corresponds to the transition from stance (to the left of the dashed line) to the swing phase (to the right of the dashed line). Normal data are extracted from the study of Stoquart et al. The Spearman coefficient showed that the duration of muscle activation was negatively correlated with the AROMr (right leg: r = −0.58, P = 0.028; left leg: r = −0.63, P = 0.015). The present study's primary objective was to describe gait abnormalities in a population of people with DM1. Although the DM1 prevalence is not different according to the gender, we have to notice that men were twice more included (10 men vs. 5 women) in our study. Moreover, since the inclusion criteria included the ability to walk 100 m, the clinical severity of our population, with a mean MFM score of 91.9%, was not representative of the DM1 population. 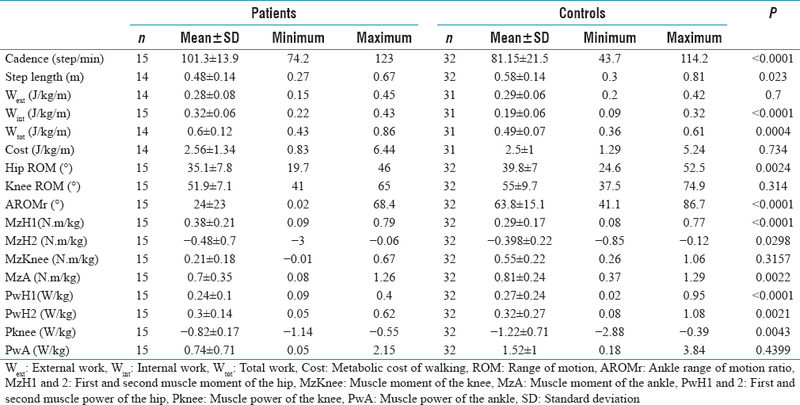 Although gait in DM1 has already been characterized in the literature, this is the first study that calculated the mechanical work and energy cost of gait in patients with DM1. Despite a higher internal work in our results, we did not observe an increase in metabolic cost. This might have been due to effective proximal and axial muscle compensations. Furthermore, no studies have reported gait analysis in DM1 on a treadmill except the short preliminary results published in 2012. There are several advantages in using a treadmill for gait analysis. First, the speed is controlled, which enables comparison with a control population under the same gait conditions. Second, the duration of gait is much longer, so it is possible to record a large number of successive gait cycles. Third, since our laboratory includes a treadmill equipped with strain-gauge sensors, it enables the energy cost calculation. Gait on a treadmill can be considered as “abnormal,” since the patient has to control his/her gait in order to follow the treadmill. Balance can also be perturbed. This explains why the gait speed on the treadmill was lower than the spontaneous comfortable speed in the 10-m walking test. Nevertheless, this method has shown good reliability when measured at 1-day and 1-month intervals in adult patients after stroke. When compared with a control (healthy) population, all but one of the patients had an abnormally low step length and used an abnormally high cadence to maintain their speed on the treadmill. We suggest that the ankle plantar flexor weakness and the abnormal agonist/antagonist co-activations in the leg muscles restrict the ability to lengthen the step in DM1. We studied the AROMr, which is related to foot drop. The ROM ratio (ROMr) was described by Ferrarin et al. in a population of children with Charcot–Marie–Tooth disease. Since the overall ROM for ankle dorsiflexion can be low when the Achilles tendon shortens, the ROMr is a better guide to active dorsiflexion ability during the swing phase [Figure 1]. Our present kinematic and kinetic analyses showed an impairment of the AROMr and ankle propulsion moment in DM1, as previously described by Wright et al. and Galli et al., Although this could be due to weakness of the dorsal flexors, our observation of abnormally long (and sometimes permanent) EMG activity in the GL suggests that dorsal flexion is reduced by the abnormal activation of the antagonists during the swing phase. Nevertheless, we notice that passive ankle dorsiflexion of the ankle was not recorded, whereas this could although affect AROMr. We did not observe the abnormal hip motion in the stance phase described by Wright et al. Although the knee flexion moment was not higher in our population than in the patients studied by Wright et al., we observed a decrease in the knee extension power during the stance phase. This knee extension power is due to eccentric contraction of the quadriceps during the initial stance phase and is impaired in the DM1 population by low knee flexion (and, in some cases, hyperextension) during stance. A major kinetic abnormality observed in our study was the impairment of the ankle extension moment before toe-off. This observation is directly related to plantar flexor weakness. As shown in [Figure 2]a, ankle extension power was abnormally low in 13 of the 15 patients – even in less affected patients who scored the highest possible MFM. Although distal weakness is a very typical feature in DM1, mild clinical impairment of the GL is not easy to assess because it is one of the most powerful muscles in the body. Thus, kinetic analysis enables the assessment of ankle extension moment loss in less affected patients. This clinically almost undetectable calf weakness can also explain the gait difficulties observed in patients who appear to have normal muscle function. The use of dynamic orthotics may be indicated in the latter patients; Aiello et al. described the benefits of using an ankle-foot orthosis with anterior support, which improved power absorption and created a push-off effect in patients with DM1. Another major feature was abnormal muscle activation, as assessed by EMG and as recently observed by Galli et al. In the present study, we decided to quantify muscle activation by identifying the onset and cessation of each muscle activation sequence and computing the average duration of activation for each patient and for each leg. As shown in [Figure 2], activation was abnormally long or even permanent (i.e., during the swing phase) in some cases. Moreover, we observed that the duration of muscle activity was negatively correlated with the AROMr. This is an unexpected result. Since DM1 affects both ankle dorsal flexion and plantar flexion muscle, abnormal prolonged activity of GL has not already been described. Nevertheless, DM1 is associated with delayed relaxation following contraction. Whereas myotonic muscle activity is present in most of the limb, it is classically observed in the hand and affects hand function. Nevertheless, is has although been described in lower limb muscles according to Mankodi and Grunseich. 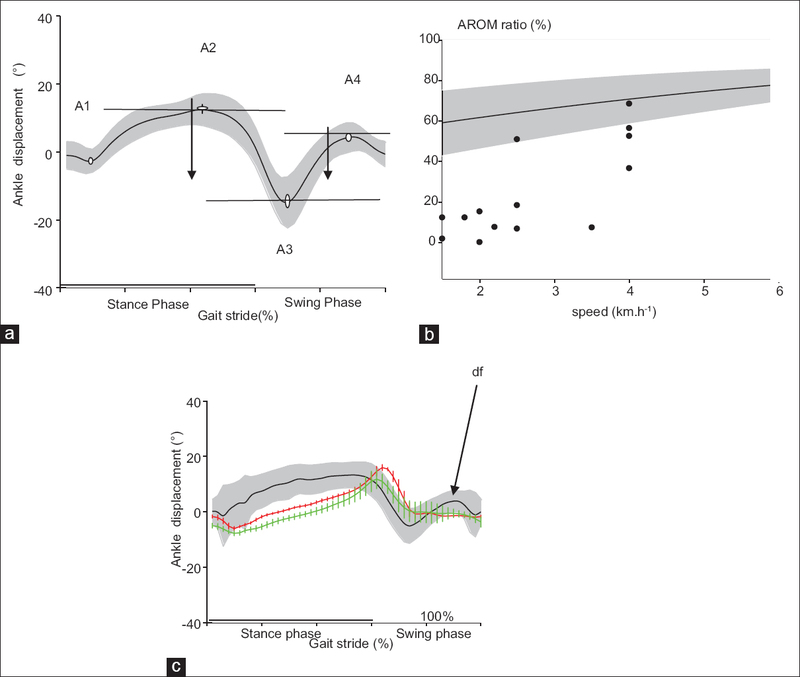 Since GL was abnormally active during the swing phase in our study, we suggest that impairment of the AROMr is a consequence of abnormal calf muscle activation combined with muscle impairment of dorsal flexion muscles. Our study did not reveal any mechanical work and metabolic cost abnormalities in DM1 patients. Despite high internal work, the metabolic cost was normal. As shown by Stoquart et al., the energy cost increase in hemiplegic patients is due to the mechanical work performed by the healthy limb in moving the COMb. This is not the case in DM1, which affects the body symmetrically. We suggest that biomechanical adaptations involving the less impaired muscles are effective. A larger study with more patients comparing more affected with less affected patients could probably be more informative. This hypothesis must be assessed in mechanical analyses of other muscular dystrophies. There are several limitations in this study. Although DM1 is one of the most frequent hereditary NMDs, it is still a rare disease; this explains why the population is small and heterogeneous. A study including adults at the onset of the disease could be more informative. The patients' data were compared to a data set of eight healthy participants who walked at different velocities. The normal population had been described previously and is not matched to the patient population. Nevertheless, the normal population did not differ from the patients on in term of age and gender. We conclude that kinematics and kinetics are affected in the population of patients affected by DM1, even in a patient with light functional impairment. Furthermore, we noted that the duration of GL activation was abnormal in all patients. Although it is not possible to affirm that this hyperactivation is a manifestation of myotonia, it seems to play a major role in gait abnormality in DM1. The major gait abnormalities in patients with DM1 are weakness and abnormal activation of the calf muscles. The gait variables are correlated with the functional impairment (e.g., the MFM). Future research on DM1 patients should investigate abnormal muscle activation, assess the potential myotonic phenomenon and study the use of dynamic orthoses. Emery AE. Population frequencies of inherited neuromuscular diseases – A world survey. Neuromuscul Disord 1991;1:19-29. Norwood FL, Harling C, Chinnery PF, Eagle M, Bushby K, Straub V, et al. Prevalence of genetic muscle disease in Northern England: In-depth analysis of a muscle clinic population. Brain 2009;132:3175-86. Brook JD, McCurrach ME, Harley HG, Buckler AJ, Church D, Aburatani H, et al. Molecular basis of myotonic dystrophy: Expansion of a trinucleotide (CTG) repeat at the 3' end of a transcript encoding a protein kinase family member. Cell 1992;69:385. Kino Y, Washizu C, Oma Y, Onishi H, Nezu Y, Sasagawa N, et al. MBNL and CELF proteins regulate alternative splicing of the skeletal muscle chloride channel CLCN1. Nucleic Acids Res 2009;37:6477-90. Mankodi A, Takahashi MP, Jiang H, Beck CL, Bowers WJ, Moxley RT, et al. Expanded CUG repeats trigger aberrant splicing of clC-1 chloride channel pre-mRNA and hyperexcitability of skeletal muscle in myotonic dystrophy. Mol Cell 2002;10:35-44. Logigian EL, Ciafaloni E, Quinn LC, Dilek N, Pandya S, Moxley RT 3rd, et al. Severity, type, and distribution of myotonic discharges are different in type 1 and type 2 myotonic dystrophy. Muscle Nerve 2007;35:479-85. Wiles CM, Busse ME, Sampson CM, Rogers MT, Fenton-May J, van Deursen R, et al. Falls and stumbles in myotonic dystrophy. J Neurol Neurosurg Psychiatry 2006;77:393-6. Missaoui B, Rakotovao E, Bendaya S, Mane M, Pichon B, Faucher M, et al. Posture and gait abilities in patients with myotonic dystrophy (Steinert disease). Evaluation on the short-term of a rehabilitation program. Ann Phys Rehabil Med 2010;53:387-98. Bae JS, Kim SG, Lim JC, Chung EJ, Kim OK. Peripheral nerve axon involvement in myotonic dystrophy type 1, measured using the automated nerve excitability test. J Clin Neurol 2011;7:90-5. Galli M, Cimolin V, Crugnola V, Priano L, Menegoni F, Trotti C, et al. Gait pattern in myotonic dystrophy (Steinert disease): A kinematic, kinetic and EMG evaluation using 3D gait analysis. J Neurol Sci 2012;314:83-7. Wright RB, Yoder DM, Costa JL, Andriacchi TP. Characterization of gait parameters in adult-onset myotonic dystrophy: Abnormal hip motion. Arch Phys Med Rehabil 1995;76:33-8. Bachasson D, Moraux A, Ollivier G, Decostre V, Ledoux I, Gidaro T, et al. Relationship between muscle impairments, postural stability, and gait parameters assessed with lower-trunk accelerometry in myotonic dystrophy type 1. Neuromuscul Disord 2016;26:428-35. Radovanović S, Perić S, Savić-Pavićević D, Dobričić V, Pešović J, Kostić V, et al. Comparison of temporal and stride characteristics in myotonic dystrophies type 1 and 2 during dual-task walking. Gait Posture 2016;44:194-9. Tiffreau V, Detrembleur C, Van Den Bergh P, Renders A, Kinet V, Lejeune T, et al. Gait abnormalities in type 1 myotonic muscular dystrophy: 3D motion analysis, energy cost and surface EMG. Comput Methods Biomech Biomed Engin 2012;15 Suppl 1:171-2. John J. Grading of muscle power: Comparison of MRC and analogue scales by physiotherapists. Medical research council. Int J Rehabil Res 1984;7:173-81. Bérard C, Payan C, Fermanian J, Girardot F, Groupe d'Etude MFM. A motor function measurement scale for neuromuscular diseases-description and validation study. Rev Neurol (Paris) 2006;162:485-93. Dierick F, Penta M, Renaut D, Detrembleur C. A force measuring treadmill in clinical gait analysis. Gait Posture 2004;20:299-303. Davis RB, Õunpuu S, Tyburski D, Gage JR. A gait analysis data collection and reduction technique. Hum Mov Sci 1991;10:575-87. Mickelborough J, van der Linden ML, Richards J, Ennos AR. Validity and reliability of a kinematic protocol for determining foot contact events. Gait Posture 2000;11:32-7. Davis BL, Cavanagh PR. Decomposition of superimposed ground reaction forces into left and right force profiles. J Biomech 1993;26:593-7. Cavagna GA, Thys H, Zamboni A. The sources of external work in level walking and running. J Physiol 1976;262:639-57. Willems PA, Cavagna GA, Heglund NC. External, internal and total work in human locomotion. J Exp Biol 1995;198:379-93. Van Boxtel GJ, Geraats LH, Van den Berg-Lenssen MM, Brunia CH. Detection of EMG onset in ERP research. Psychophysiology 1993;30:405-12. Lusk G. Animal calorimetry. Analysis of the oxydation of mixtures of carbohydrate and fat. A correction. J Biol Chem 1924;59:41-2. Lobet S, Detrembleur C, Hermans C. Impact of multiple joint impairments on the energetics and mechanics of walking in patients with haemophilia. Haemophilia 2013;19:e66-72. Stoquart G, Detrembleur C, Lejeune T. Effect of speed on kinematic, kinetic, electromyographic and energetic reference values during treadmill walking. Neurophysiol Clin 2008;38:105-16. Dogan C, De Antonio M, Hamroun D, Varet H, Fabbro M, Rougier F, et al. Gender as a modifying factor influencing myotonic dystrophy type 1 phenotype severity and mortality: A Nationwide multiple databases cross-sectional observational study. PLoS One 2016;11:e0148264. Caty GD, Detrembleur C, Bleyenheuft C, Lejeune TM. Reliability of lower limb kinematics, mechanics and energetics during gait in patients after stroke. J Rehabil Med 2009;41:588-90. Ferrarin M, Bovi G, Rabuffetti M, Mazzoleni P, Montesano A, Pagliano E, et al. Gait pattern classification in children with charcot-marie-tooth disease type 1A. Gait Posture 2012;35:131-7. Aiello E, Cereatti A, Fadda P, Fodde A, Croce UD. Gait analysis for an orthosis project in a patient with Steinert myotonic dystrophy. Gait Posture 2006;24:S44-5. Mankodi A, Grunseich C. Toe-extension myotonia in myotonic dystrophy type 1. Neurology 2015;85:203. Stoquart G, Detrembleur C, Lejeune TM. The reasons why stroke patients expend so much energy to walk slowly. Gait Posture 2012;36:409-13.